Thousands of children living in conflict-affected areas of Ukraine are at risk due to low vaccination coverage and problems in the surveillance system. WHO and health partners support vaccination campaigns in these areas. After 3 years of conflict, health-care resources in conflict-affected areas of Ukraine are severely stretched and humanitarian funding is plummeting. At the same time, health facilities continue to be damaged by heavy shelling. The health of millions of Ukrainians is hampered by limited access to health facilities and services, and by insufficient funding for humanitarian health interventions. For World Humanitarian Day on 19 August 2017, WHO/Europe highlights urgent humanitarian health needs in eastern Ukraine, and recognizes the critical and often dangerous work of health professionals in delivering services to those most in need. What makes the situation so severe? Since the start of the conflict, at least 160 health facilities have been shelled on both sides of the contact line, while some 130 facilities remain either partially or fully nonoperational. This seriously limits access to critical health care. WHO is concerned by such violations and maintains that health facilities and personnel, strictly protected under international humanitarian law, are not a target for violence (Twitter hashtag #NotATarget). Access to health care remains most difficult in areas closest to the contact line. There, the health-care system faces shortages in qualified medical staff and disruptions in the delivery of supplies. Over 400 health facilities in these conflict areas in Ukraine report insufficient stocks of medicines. The number of health partners present in the field is very low due to accreditation issues in non-government controlled areas (NGCA), security restrictions on both sides of the contact line and continuing funding shortfalls. Limited and unpredictable access to NGCA is a major challenge for delivering humanitarian assistance to those in need. The crisis has affected 5 million Ukrainians on both sides of the contact line so far and has led to the internal displacement of about 1.6 million people. Most of those affected live in NGCA. An estimated 3.8 million of the affected people are in need of health care. Health needs range from general services and essential trauma care, to access to diagnosis and therapy for tuberculosis, HIV, poliomyelitis and sexually transmitted infections. Communicable diseases can easily spread due to malfunctioning surveillance and lack of preparedness and prevention measures. Child health is compromised by low vaccination coverage, with increasing outbreaks of rubella and mumps. Although under-reported, cases of sexual and gender-based violence are also on the rise, especially along the contact line, and treatment services are very limited. Access to life-saving medicines and treatment for chronic diseases such as mental ill health and diabetes is also an issue of concern. 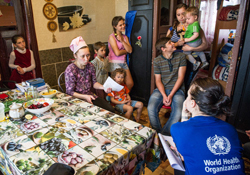 WHO has been working with health partners since the start of the conflict to provide primary health-care services, medicines, ambulances and other essential medical items, and to ensure that Ukraine’s most vulnerable communities receive support. It also undertakes health prevention, preparedness and recovery activities such as vaccinations, training and surveillance. In 2016 alone, WHO and partners set up 35 mobile emergency primary health-care units (MEPUs) that operate along the contact line, where the provision of health services has been cut or severely disrupted. Last year MEPU personnel provided over 230 000 consultations, mostly to internally displaced persons. In addition, multidisciplinary MEPUs teams assisted in the provision of mental health and psychosocial support. Health partners also established 70 sentinel sites and started regular reporting on infectious diseases. Throughout 2016, WHO delivered over 170 tons of medical supplies for more than 350 000 people, including medicines for chronic diseases, life-saving support for 50 000 diabetic patients, some 14 000 rapid blood tests and supplies for 1800 complex and lifesaving surgical operations. The funding WHO requested in the 2017 Ukraine Humanitarian Response Plan – about 21% of the funding for the whole health sector – addresses very critical health interventions only. To date, one third of this amount remains uncovered. In 2016, only 15% of the funding needs of the overall health sector were met. Public health activities and quality care for patients are under pressure, raising concern about possible disease outbreaks. In 2017, generous contributions by Canada, Germany and Italy have allowed WHO to provide critical support for access to primary health care, to cover some gaps in care for noncommunicable chronic diseases, and to support laboratory services, trauma care and mental health-care needs. However, low vaccination coverage and poor surveillance of communicable diseases, inadequate access to medications for cancer patients, and lack of access to mental health and rehabilitation care remain critical gaps that require urgent action.